After some leaked photos, I finally have word on their confirmation and a new line! Check out official information and photos on upcoming Doomlands 2169 line, coming out Fall 2015. Stay tuned for more information and my thoughts on these blasters. With the debut of the NERF DOOMLANDS 2169 line, members of NERF NATION can become the heroes of the future. This all-new NERF blaster segment was designed to inspire active, imaginative play with a futuristic edge only the NERF brand can provide. The year is 2169, nearly a century after an asteroid impact wiped out civilization as we know it. The post-apocalyptic wasteland once known as earth is filled with bands of marauding thieves and all manners of creatures. Now, the time has come for a hero to emerge from the wild, savage land to deliver justice and freedom to the human race with the new NERF DOOMLANDS 2169 blasters by their side. The debut DOOMLANDS 2169 lineup, featuring the LAWBRINGER blaster with a twelve dart rotating barrel and the pump-action VAGABOND blaster, is available exclusively at Target this fall and features all new sci-fi steam-punk designs, visible firing mechanisms, and NERF performance. In the epic battle for the future, NERF NATION will prevail. Patrol the lawless landscape and fight for justice with the NERF DOOMLANDS 2169 LAWBRINGER blaster at your side. The formidable LAWBRINGER blaster features a twelve dart rotating barrel and visible hammer mechanism for blasting, while integrated dart storage allows for quick reloads on the run. With the LAWBRINGER blaster, no futuristic foe is safe. Blaster comes with twelve NERF DOOMLANDS 2169 darts. Available exclusively at Target. Survive the savage future and dominate post-apocalyptic battles using the NERF DOOMLANDS 2169 VAGABOND blaster. 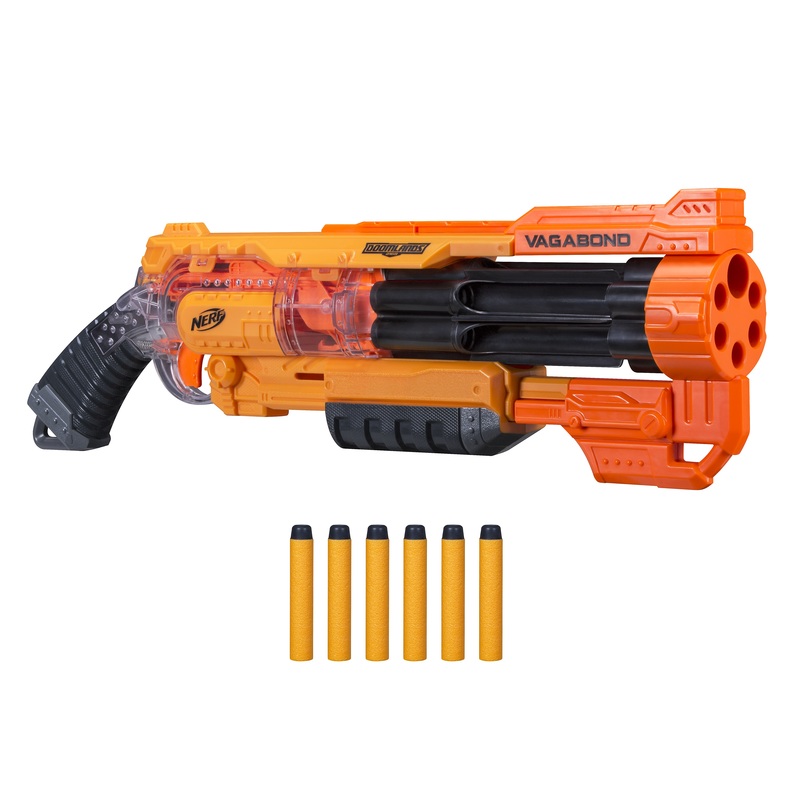 With unique DOOMLANDS style, pump action firing, and a six dart rotating barrel, the VAGABOND blaster is an essential tool for future freedom fighters. Includes six NERF DOOMLANDS 2169 darts. Available exclusively at Target. Stock up on extra NERF ammo to ensure dominance in the wild future. Post-apocalyptic heroes carrying the DOOMLANDS 2169 30-DART refill won’t be caught with an empty blaster in battle. DOOMLANDS foam darts feature gold deco with signature DOOMLANDS logo. Available exclusively at Target. A couple of the members of Bay Area Nerf got together to shoot this short film featuring the new Zombie Strike Hammershot blasters. I wasn’t expecting how this was going to turn out and got a laugh out of it. Thanks to Bay Area Nerf for the heads up. As revealed by Io9 earlier today, and confirmed by a press release sent to me today, the Zombie Strike line is now officially acknowledged by Nerf, and more products from the line were revealed, as well as their anticipated release months in the USA. The Hammershot and Sledgeshot have already been revealed by Target, but here they are again along with official product descriptions and targeted release months. The zombie apocalypse is on its way and Hasbro’s NERF ZOMBIE STRIKE line has landed just in time! Fans can reenact their favorite, action-packed zombie scenes, plan for epic battles against the undead and hone the skills necessary to ensure the survival of the human race. The debut ZOMBIE STRIKE lineup, featuring the multi-shot SLEDGEFIRE blaster and the front loading HAMMERSHOT blaster, is available exclusively at Target this fall and features all new zombie-influenced deco and designs. In an epic battle of the living vs. the living dead, NERF NATION will have the edge. One way to survive the zombie apocalypse: Keep moving. The compact ZOMBIE STRIKE HAMMERSHOT blaster is designed for defeating the living dead on the run! 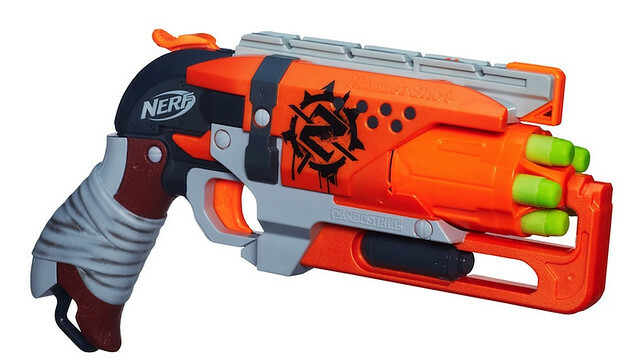 Featuring a five dart, front loading rotating barrel and a unique pull-back hammer mechanism, the HAMMERSHOT blaster is the go-to for sudden zombie attacks. Includes five NERF ZOMBIE STRIKE darts. Available exclusively at Target. Zombie hunters fend off large hordes with ease using the ZOMBIE STRIKE SLEDGEFIRE blaster. A new triple dart shell-system allows for simultaneous multi-shot blasting and quick dart reloads on the run while extra storage space for darts keeps zombie invasions at bay. With the SLEDGEFIRE blaster it won’t matter if the approaching undead are the fast kind or the slow kind – they’ve met their match. 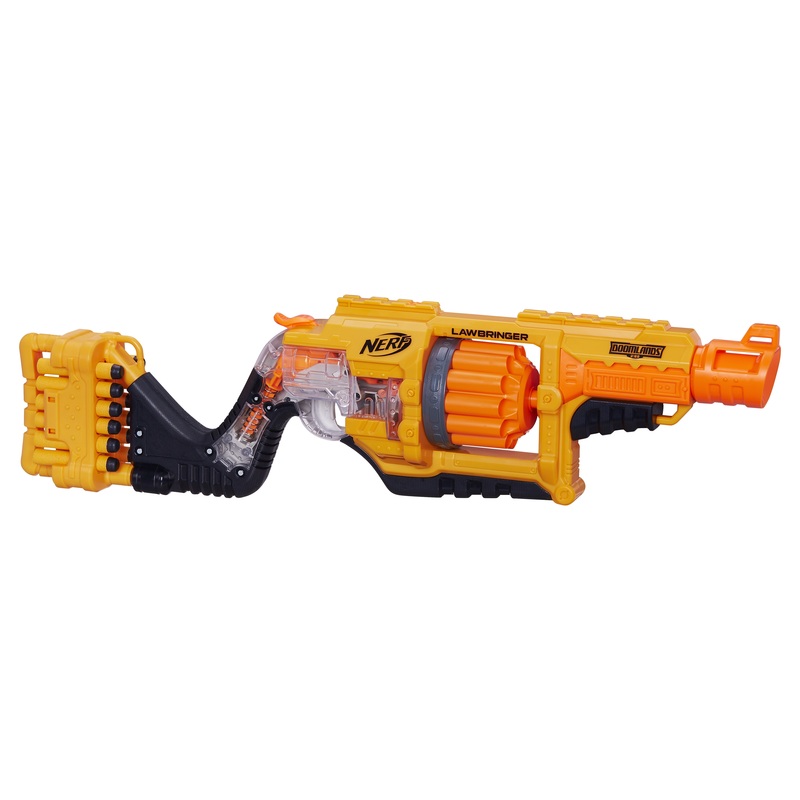 Blaster comes with three NERF SHELLS and nine NERF ZOMBIE STRIKE darts. Available exclusively at Target. After launching as a Target exclusive in late 2013, the NERF ZOMBIE STRIKE line will expand in 2014 to a full line of blasters, bows and foam swords designed for epic battles against undead and available at most major retailers nationwide! Additions include the FUSEFIRE blaster, which blasts zombies with glowing VORTEX discs day or night, and the authentic CROSSFIRE bow with 75 foot N-STRIKE ELITE distance. With the 2014 ZOMBIE STRIKE line-up, NERF NATION zombie hunters are ready for anything. 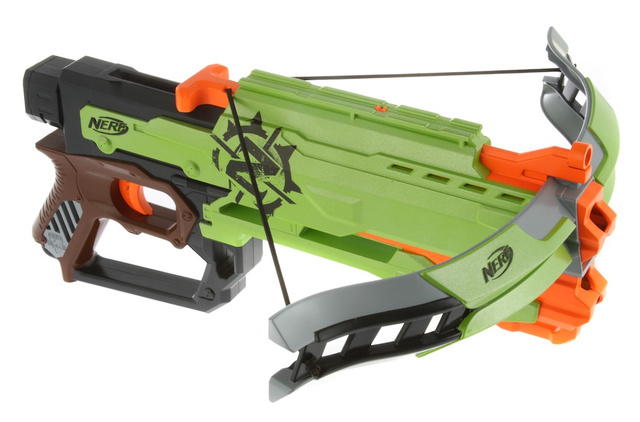 Protect your human allies with the ZOMBIE STRIKE CROSSFIRE bow, which brings iconic crossbow action to the NERF line for the first time in almost twenty years! Boasting 75 foot ELITE distance and authentic pull-back firing action, the CROSSFIRE bow is a great asset in the human zombie struggle. Crossbow comes complete with four NERF ZOMBIE STRIKE darts. Available at most major retailers nationwide and HasbroToyShop.com. Keep viewing the post for the rest of the new Zombie Strike blasters!